One of the greatest composers of all time. The music of Palestrina is an embodiment of purity and perfection. One of the most revered names in liturgical music and the foremost composer of the Roman Catholic Church, Palestrina was born of poor parents and little is known of his early life. He is said to have earned his living first as a church-singer. He probably studied in Goudimel's school. Later he was an organist in Palestrina, the town of his birth, then magister puerorum (master of the boys singers) in the Cappella Giula with the title Maestro della Capella della Basilica Vaticana. Palestrina dedicated a book of masses to Pope Julius III who in January of 1554 admitted him to the Pontifical Chapel as a singer. The Pope admitted him against the rules as Palestrina had a wife and not a decent voice. On July 30, 1555, Paul IV dismissed him with a pension of six scudi per month. This blow affected Palestrian very deeply as he had four children to support. In fact he suffered so deeply that he was afflicted with a nervous prostration. On October 1, the Pope appointed him the conductor at the Lateran church in Rome. in 1560, he produced his famous and extremely beautiful Improperia for Holy Week with such success that the Pope secured the work for the Sistine Chapel where it has been performed every Good Friday since. 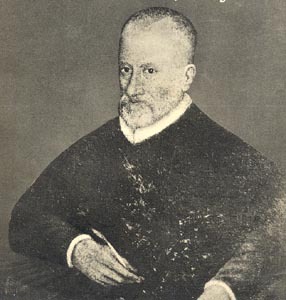 In 1561, Palestrina took a higher paying position as conductor at Santa Maria Maggiore. The Pope was determined to rid church music of its astonishing secular qualities: first, the use of street-ballads, even when indecent, as canti fermi (the cantus fermus is the melody on which masses and motets can be based). Many of the choir members would actually sing the words of the secular song instead of the latin words of the liturgy. Second, the Tumultuous counterpoint with which the sacred texts and the secular tunes were overrun. The Council of Trent and a committee of eight cardinals, considering the matter seriously, decided not to revolutionize church music entirely, and in 1564 commissioned Palestrina, by this time famous, to write a mass that would reform, without uprooting, ecclesiastical polyphony. He wrote three noble masses and the third, the Missa papae Marcelli won the most profound praise. Palestrina was called "the savior of music" and was appointed composer to the Pontifical Chapel. In 1571, he became, remaining until his death, the maestro of St. Peter's. He also composed for the Congregazione del Oratorio, taught in Nanini's school, and was from 1581 maestro concertatore to Prince Buoncoompagni. Pope Sixtus V wished to appoint Palestrina maestro of the Sistine Chapel, but the singers refused to serve under a layman. He was, however, commissioned to revise the Roman Gradual and Antiphonal by Pope Gregory XIII. He published the Directorium chori in 1582, the offices of Holy Week in 1587, and the Praefationes in 1588, but on the death of his pupil and assistant, Giudetti, he was compelled to leave the work unfinished. A complete edition of his works was published by Breitkopf and Hartel, the great German publisher, in the 19th Century. This will serve as a good introduction to Palestrina's life and music, as well as the other great renaissance composers (Byrd, Victoria, Josquin des Pres and Lassus. 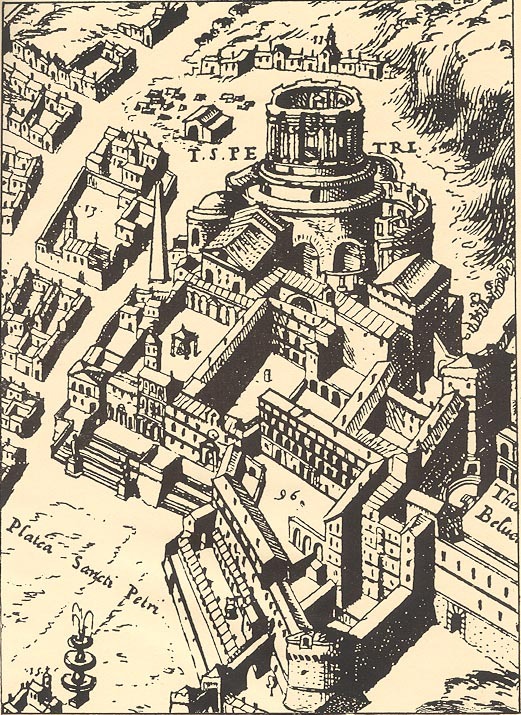 Rome In Palestrina's DayThis illustration is taken from an old map of 1570 showing St. Peter's in the course of reconstruction. The house where Palestrina lived for nearly a quarter of a century and died was probably situated in the street at the top left-hand corner of the picture.